MAY 2, 2008: When the economic stimulus package was signed by President Bush on February 13, Association staff began reviewing information, released by the Internal Revenue Service, detailing the new federal law. Based on our reading of the IRS material at that time, we believed that public retirees could not use their pension income in order to qualify for the stimulus payment. The meeting between the Stoneham Board of Selectmen and Stonehamâ€™s retired teachers scheduled for April 22 was cancelled. This meeting was to be held for the purpose of withdrawing retired teachers from the stateâ€™s Group Insurance Commission (GIC). Active and retired members of the State Retirement System have received ballots for a very important election at the State Pension Reserves Investment Management (PRIM) Board. MARCH 9, 2008: The state’s Group Insurance Commission (GIC) has approved the insurance rates for Fiscal Year 2009, which begins July 1, 2008. On average, the state-run public retiree and employee healthcare plans will increase 6.4%. Last year, rates increased 3.78% following an average increase of 7.47% in 2006. Each year the GIC has posted increases well below the state and national averages. 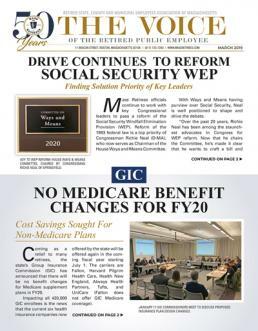 MARCH 2008: At times, members who have lost part or all of their Social Security benefit to the Windfall Elimination Provision (WEP) or Government Pension Offset (GPO) may feel as if they are alone in their fight to repeal both federal laws. MARCH 2008: There were few surprises when Governor Deval Patrick unveiled his proposed $28.2 billion Fiscal â€™09 State Budget and sent it to the Legislature on January 22. The three-percent July â€™08 COLA for state and teacher retirees, as promised, was included in his budget. And, as we were earlier informed, the 10% insurance premium contribution for state pensioners, who retired prior to July 1, 1994, and 15% for those who retired after that date, will not change. MARCH 2008: Starting with a special study in 2004, the Association has spent the past four years moving the debate forward on raising the COLA base to a higher level. In 2005, the Public Employee Retirement Administration Commission (PERAC) recommended that the COLA base be raised from the current level of $12,000 to a new level of $16,000. The current $12,000 base was established by the Legislature nearly eleven years ago in 1997. MARCH 2008: Following through on his commitment to fully examine the potential repeal of the Windfall Elimination Provision (WEP) and Government Pension Offset (GPO), US Congressman Michael McNulty (D-NY) chaired a key January hearing that put the spotlight on Social Security reform for public retirees. MARCH 2008: Although the Commonwealth pension fund continued its run of double digit earnings for the fifth straight year in 2007, this Januaryâ€™s market dive raised concern among managers of pension funds everywhere. "Year 2007 was a good one for the Stateâ€™s PRIT Fund," said Association President Ralph White. "Januaryâ€™s storm clouds were not completely unexpected, but weâ€™ll recover," said the ever-optimistic White. FEBRUARY 14, 2008: Retirees, who have at least $3,000 in earned income for 2007 may be eligible for the federal tax rebate, signed into law by President Bush today. For the purpose of the tax rebate, â€œearned incomeâ€ includes earnings from employment, including Social Security. 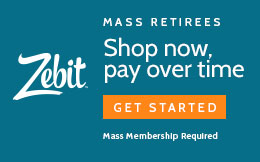 In other words, if a retiree has earned at least $3,000 in 2007, from a job or Social Security, then they may be eligible for the rebate scheduled to be paid in May. Also, in order to qualify for a rebate, a 2007 tax return must be filed with the IRS. FEBRUARY 12, 2008: On Monday President Bush signed the Economic Stimulus Package into law, thus approving the highly anticipated tax rebate. While it is clear that Social Security income can now be counted toward earned income, Association officials are now analyzing the new law and will update members as to its key provisions on Wednesday. JANUARY 28, 2008: Association officials are closely monitoring developments in Washington D.C. relative to the so-called tax rebates now being debated on Capital Hill. The tax rebates are a critical part of a larger Economic Stimulus Package endorsed by President George W. Bush and passed by the US House last week. Now before the US Senate, the proposal is under considerable scrutiny as the details are being worked out. JANUARY 9, 2008: The US House of Representatives will hold a public hearing on Social Security’s Windfall Elimination Provision (WEP) and Government Pension Offset (GPO) on Wednesday January 16, 2008. Association official will be submitting testimony to the Committee on Social Security, which is conducting the invitation only hearing. JANUARY 2008: Retirement Boards, across the Commonwealth, will once again have the opportunity to vote 3% COLAs for their eligible retirees effective July 2008, rather than a 2.3% increase, an alternative option allowed by law. JANUARYÂ 2008: With pressure on local government to control the rising cost of health care at an all-time high, much attention has been brought to the insurance companies that provide the coverage for tens of thousands of local retirees and employees. DECEMBER 18, 2007: Economists and state tax officials have cautioned legislative leaders and the Patrick Administration that the Commonwealth may be on the verge of a recession, with a budget shortfall almost certain for Fiscal Year 2009. However, while the state may undergo some fiscal belt tightening, state officials have made it clear that an early retirement incentive (ERI) is not being considered. December 2, 2007: The Joint Committee on Public Service has completed its formal hearing process for the year. All 18 Association bills have now had a public hearing and are awaiting further action at various stages within the legislative process. The Association is pleased to announce the endorsements of John "Jay" Dow and Karen Mitchell for election to the Massachusetts Teachers' Retirement Board. This election is now underway, with ballots having now been mailed to all retired and active teachers, who are members of the MA Teachers Retirement System (Boston teachers are members of the City of Boston Retirement System and are not members of the MTRS). OCTOBER 22, 2007: We regret to announce the death of Billy Rehrey (age 25), son of Association Executive Vice President/Legal Counsel Bill Rehrey and grandson of Association President Ralph White, died suddenly of a heart attack, while watching Game 7 of the American League Championship Series, at a family gathering on Sunday night. Update: We wish to thank the many members and friends who sent condolence cards on behalf of the sudden death of Billy Rehrey, the son of Association Legal Counsel/Vice President Bill Rehrey and grandson of Association President Ralph White. The funeral was very uplifting on a sunny autumn day with surrounding foliage at its peak. Also, we thank those who donated to the Cardiac Clinical Research Fund at Children’s Hospital. OCTOBER 12, 2007: Governor Deval Patrick and legislative leaders have agreed to extend the deadline for local governments to join the state's Group Insurance Commission to October 29, 2007. Originally, an October 1, 2007 deadline existed under the law. However, due to local interest in joining the GIC and the fact that negotiations are underway in a number of local communities, state leaders opted to extend the deadline. OCTOBER 5, 2007: Members who retired prior to July 1, 2004 and chose an Option C pension remain outraged over the issue of the outdated mortality used to calculate their pension. Legislation moved forward this week that could bring about a resolution to the issue. Ballots will shortly be sent to all members of the State Retirement System for a very important election. Association President Ralph White is running for re-election to a new three-year term as one of the two elected members of the State Retirement Board. The second elected seat is currently being held by Theresa McGoldrick. Her term will not expire this year. â€œRetirees need an experienced member on the Board upon whom they can count to look out for their best interests and those of their survivors, someone who will fight on their behalf, both at the Retirement Board and at the Legislature. â€œThere are seven candidates in this case. In a random pick for ballot position, I am fifth. You will see the word incumbent next to my name. Do not take this election for granted. Please take the time to return your ballot as instructed so that it will be registered and be counted. Your vote is very important to all retirees even though they may belong to one of our other retirement systems. SEPTEMBER 12, 2007: After hearing the outcry of Association members, outraged by the lack of federal action on the issues of WEP/GPO repeal, US Senator John Kerry has agreed to support our Association’s request to hold public hearings on the issue of Social Security this fall.